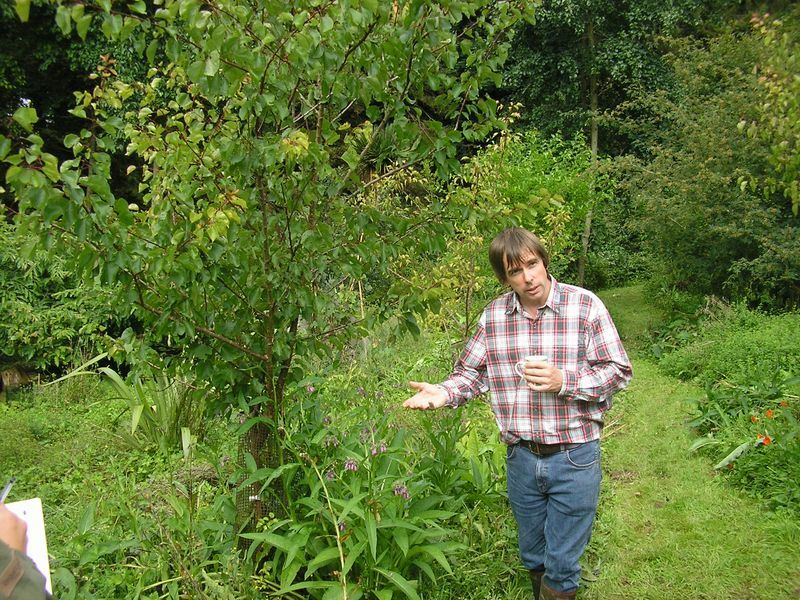 Martin Crawford, the UK’s premier Forest Gardener in his own Forest Garden. I recently wrote about succession in ecosystems. So, how do we apply that knowledge? This is a great place to utilize Permaculture Principle One: Observe and Interact. Now that we have a better understanding of succession, we can answer an important question when we are evaluating or “observing” a piece of land. What state of succession is this land in right now? Likely, our answer will be something like this: The section over here is in a Steady State (or close to it). The section over there is Oldfield Mosaic. This area that used to be a corn field is just entering Soil Initiation. The “interact” portion of Permaculture Principle One has a bit more to it. It really depends on our goals. Most people would naturally think that our goal should be do develop and design for a Climax or Steady State. However, we now know that production peaks in mid-succession. When exactly this occurs is a lot more difficult to pin down, but it is typically somewhere from the Oldfield Mosaic stage to the Transition to early Climax stage. We also know that diversity increases with more disturbances. In a sense, we never want our land to arrive at the Climax stage, but we would rather it continuously cycle between disturbance and secondary succession. It is those disturbances that we will create and manage to keep our ecosystem productive. We don’t do this with burning down our forest or bulldozing all the fruit trees, but we do it with pruning, culling, coppicing, and harvesting. We can also manage the secondary succession, give it direction, and help it on its way. So how is this done? Let’s take a closer look at each of these methods. Pruning – this is trimming a plant to accomplish a number of goals. It can be used to trim away diseased portions of the plant. It can be used to trim away dead or old non-productive branches. It can be used to open up space for a view or to cut back overgrowth on a trail or path. It can be used to allow more sunlight through the branches. It can be used to thin a tree to allow more wind to go through the plant than over and around it. It can be used to shorten the plant for easier harvest or to prevent it from growing over a roof or into electric lines. It can be used to train a plant to grow in a certain pattern or direction. The list can go on and on. Whatever the reason for our pruning, it allows more sun and rainfall through, and therefore changes the microclimate underneath. We can plant species that will grow well in this new microclimate or let the understory change on its own. Culling – this is removing a plant for a number of reasons. We cull plants because they are too big, too small, too expansive, too much work, not productive enough, not a species or variety we like (appearance, fruit, etc. ), if it was planted in the wrong place years ago, if it is casting too much shade, blocking too much wind, blocking a view, too disease or pest prone, etc. When we cull a plant, especially a large shrub or tree, we suddenly have a very large area underneath no exposed to sunlight, rainfall, evaporation, decreased shade, decreased leaf fall, etc. This is an opportunity for sun loving plants fill that void. We can let nature decide, but better yet (since this is typically a much larger space) we can immediately fill that gap with plants that would do well in that new microclimate. Fill it will plants that can benefit us and the ecosystem as a whole. Coppicing – this is cutting trunk and branches from a tree to harvest the wood while not killing the plant. In a number of years, and this varies depending on species and climate, the plant can be harvested again. Read this article for a more in depth description. Coppicing lies between pruning and culling. It significantly opens up a large gap as culling does, but it does not leave that space open for other large shrubs or trees to take over. Plant species with shorter life spans can grow, mature, and produce a good harvest for a few years before the coppiced plant shades out the understory again. Blackberries and gooseberries are shrubs that can fill this niche, but many herbaceous perennials will as well. Herbs and even annual vegetable gardens can be even placed here for a few years. This will take advantage of the good soil that had been building up under the tree, and will give us reason to rotate our annual vegetable plot locations. We just need to keep in mind root depth, as the coppiced tree stump or “chair” is still there in the ground (so root crops like carrots may not be a great idea), and negative allelopathy, the ability for some plants (e.g. black walnut) to produce chemicals from their roots and fallen leaves that inhibit growth of other plants. Harvesting – this is taking anything from the plant that we are going to use. Harvesting the fruit or leaves off a plant typically is not done in such a way as to change the microclimate around the plant. The type of harvesting that will change the microclimate is with coppicing or significant pruning (e.g. bamboo). Managing Secondary Succession – As described above, anytime we create a new microclimate and have the opportunity to sow seeds or place new plants in that location, we are, in effect, managing secondary succession. We could let nature do this on its own, but we will likely end up with plants that are considered “weeds”. What this really means is that plants for which we don’t have a significant use have filled a place we would rather grow other species. So let’s beat those less than desirable plants to the punch. If we completely fill that new location with beneficial plants and seeds that are well suited for that microclimate, then our plants will typically out-compete those other plants. If we do this over and over again with any disturbance that occurs, whether planned or unplanned, then we will eventually have a very diverse, very resilient ecosystem that is chock full of plants for which we have direct or indirect use. Direct use would be the harvest of fruit, vegetable, wood, fuel, cordage, medicinals, animal feeds, etc. Indirect use would be beneficial insect attractors, dynamic accumulators, mulch plants, windbreak plants, barrier plants, etc. So, in closing, this is a general overview of utilizing the concepts of succession in an established woodlot or forest garden. I’ll be writing soon about how to apply succession in the development of an empty field.